Toan Lam and his family escaped war-torn Vietnam by boat in the 1970s, settling in South Sacramento, California. They had only $4 to their name and could not speak English. With 10 people living in a mobile home, they began their journey to create a new life – their “American Dream”. Though Toan’s parents had visions of him becoming a doctor, lawyer, or engineer, his idea of the American dream was not about money or material wealth. He wanted to relate to the world around him and continue his life journey in a different way – his way. Becoming a journalist against his parents’ wishes, Toan used his opportunites and talents to give back, bringing himself joy and achieving his dreams while still only in his early 30s. He was a television reporter in San Francisco, co-host of a PBS show and a college instructor. Despite this success, he was not completely happy. News reporting on such topics as death and destruction daily weighed heavily. In 2009, though, he was laid off from that job, which left him with the freedom to pursue a new dream. Friends, mentors and strangers alike told Toan they felt better after spending time with him. Some nicknames started becoming commonplace, such as “Toan Time”, “Asian Male Oprah” and “Toprah”. He began sharing his story by starting a non-profit called “Go Inspire Go” (GIG), a multimedia platform that highlights everyday heroes to bring out and inspire the hero in all of us. He also launched the TruthDare podcast, where he realized his own calling. Toan is now “Chief Inspirator” of Go Inspire Go. The equation is simple: Authentic storytelling + Social media = Action. Since 2009, he has rallied over 150 volunteers globally and produced dozens of original videos of heroism and hope, helping to send 32 kids in Haiti to school, helped a kindergartner raise 200,000 meals for a food bank, and saved the lives of suicidal teens. GIG’s work has been shared by ABC’s “Good Morning America,” Disney & Hallmark Channels, Yahoo and more. He has shared his story as a motivational speaker with Coca-Cola Scholars Foundation, Rotary International, TechSoup and Seed It Up in Australia. The Go Inspire Go vision has also expanded to youth through their Community Heroes program. Community Heroes is a parent-facilitated school club that helps sow the seeds of compassion in youth by using Go Inspire Go videos to inspire elementary school students to action in their community. With adult guidance, kids run collection drives, fundraisers and service projects throughout the school year. Each year, these efforts are highlighted by a “Day of Giving,” which brought together 300 students and parents from 14 school communities to help with a multitude of service projects on a Sunday this past March. 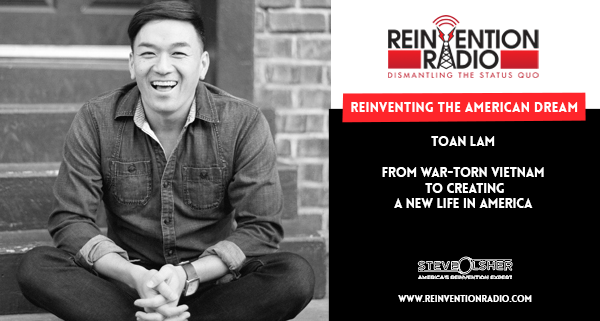 TUNE IN to this episode as Toan chats with Steve, Mary and Richard about his family’s escape from Vietnam and creating a new life in America. Reinventing Suicide Stigma – In this episode, the Reinvention Radio Crew talks with Marybeth who shares the story around the recent death by suicide of her boyfriend, Steve. And our own producer, Kelly, whose nephew took his own life only days before the show aired.